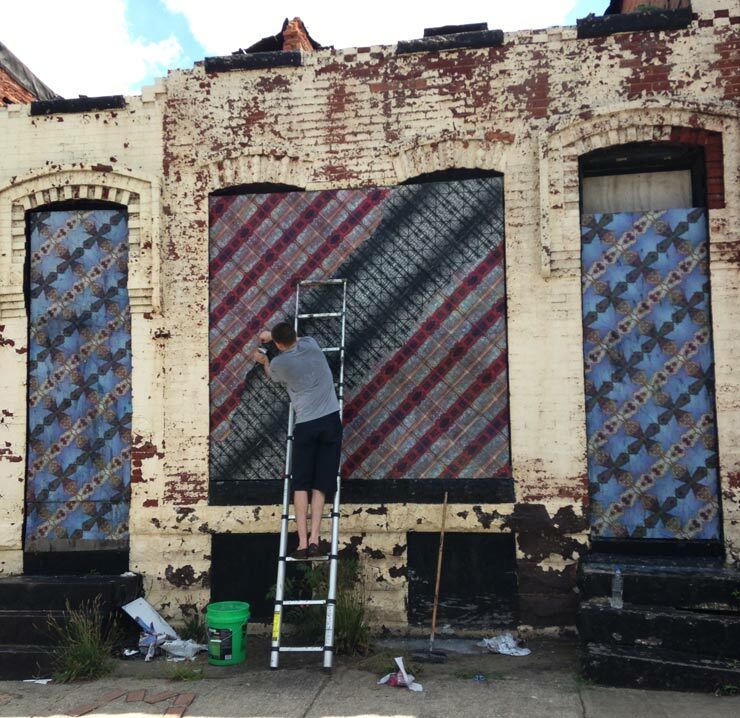 In a twist on the Broken Windows Theory, street artists are using their skills to combat urban blight in Baltimore with "The Slumlord Project". 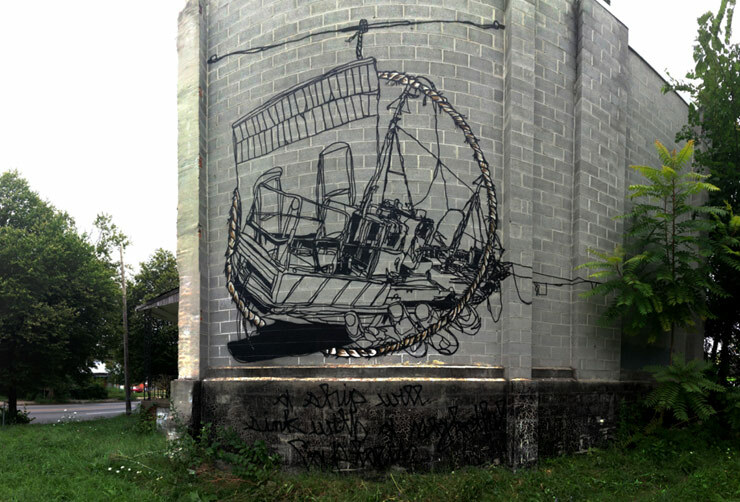 By drawing the attention of neighbors to abandoned and vacant properties and giving pertinent ownership information to take action on, 17 artists are spray painting and wheat-pasting in a D.I.Y. 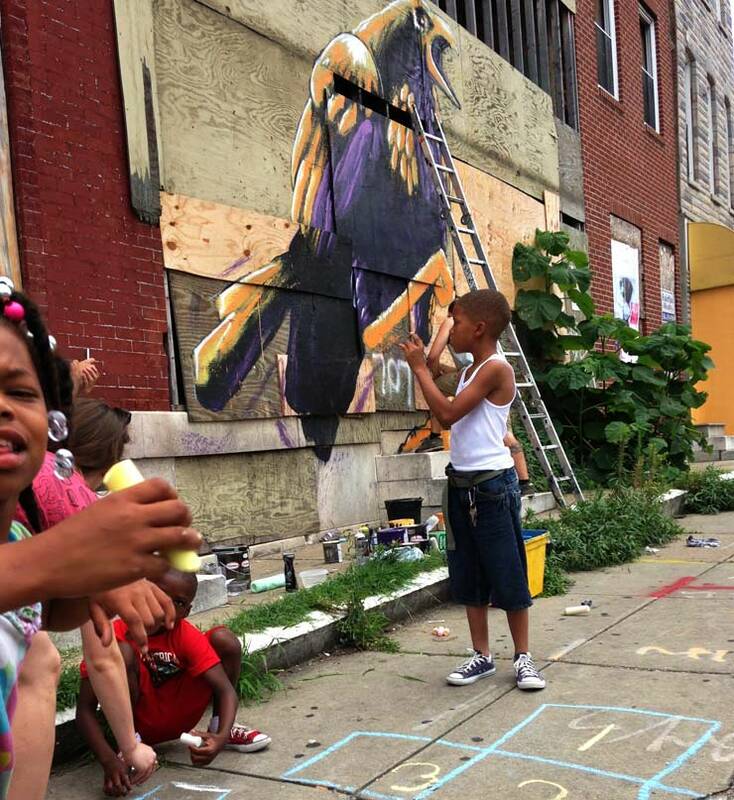 educational program that aims to renew the social contract in communities hard hit by crumbling real estate, crime, and diminished opportunity. 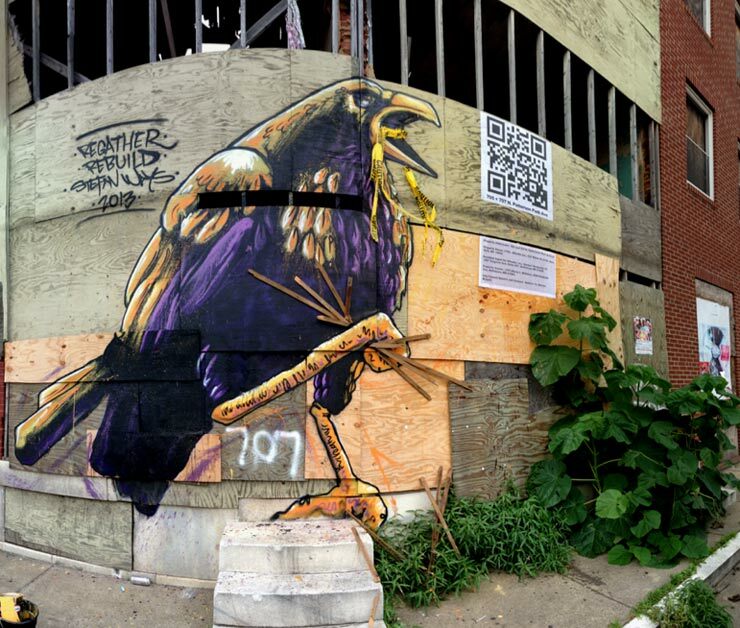 With tongue in cheek, Baltimore street artist Nether calls "The Slumlord Project" an "unsanctioned public art festival," where artists are invited to conceive of targeted installations on neglected properties. 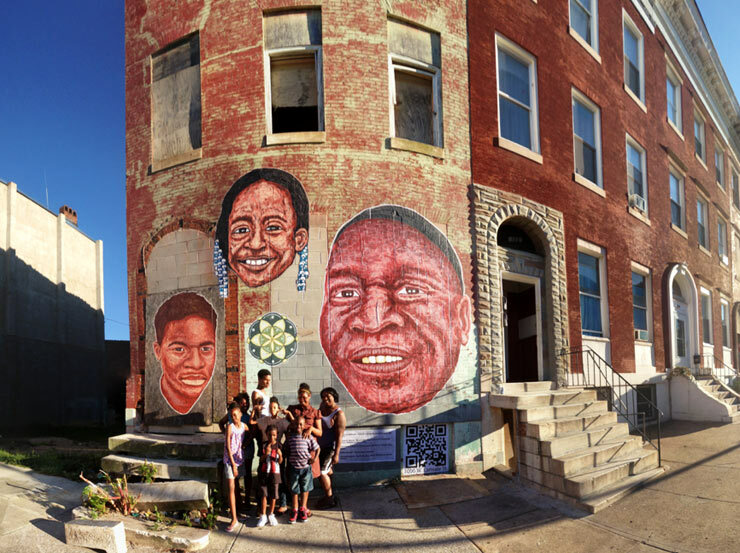 Along with Carol Ott, the founder of website and organization The Slumlord Watch, he encouraged artists to create with a sense of focus to draw attention to the companies, investors, private tax payers, and even the Housing Authority of Baltimore City about the large swaths of depressing and dangerous buildings decaying where neighborhoods and communities once flourished. The result? A good old-fashioned bricks and mortar shaming project that calls property owners on the carpet, activates city agency responses, and encourages neighbors to get involved in a civic way to improve conditions on their block. 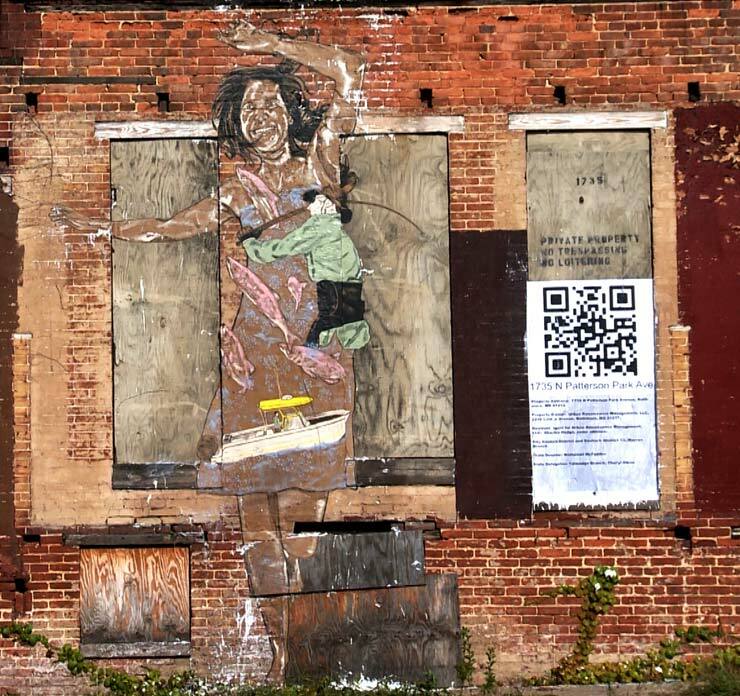 "The goal of the project was to catalyze a larger conversation about Baltimore's ignored vacancy issue," says the Nether, who had been putting up his wheat-pasted portraits of neighborhood folks on boarded-up doorways of the city's abandoned buildings when he met Ott and became impressed with her enthusiastic online blog that documents the sad side of Bmore. Just how many buildings are vacant ranges from the city estimate of 16,000 to community group estimates of more than 40,000. But just looking at a Google map that uses some of the data from the groups website gives an idea how widespread the problem of vacancy is in Baltimore. "It's really frustrating when the government won't acknowledge the problem," says Ott in a video about her experience with her organization and her work to make neighborhoods structurally safer, "You cannot fix what you won't acknowledge." 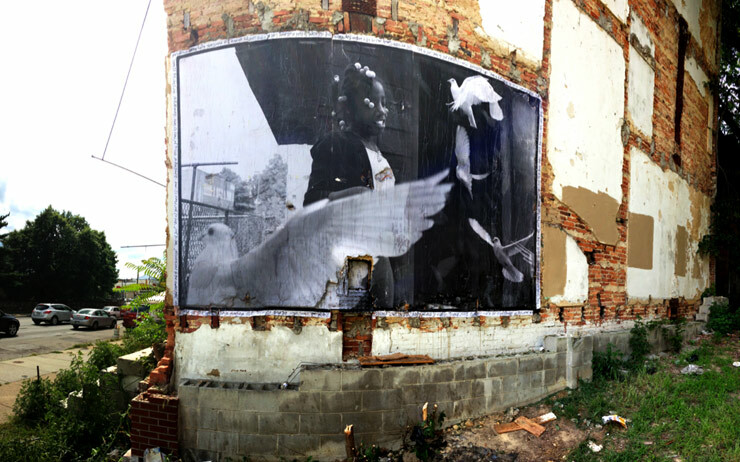 Now with "Wall Hunters Inc", a recently created non-profit organization, Nether has invited 17 artists to create this new series of installations that combine art and activism - installing unauthorized artwork on various dilapidated vacant houses. 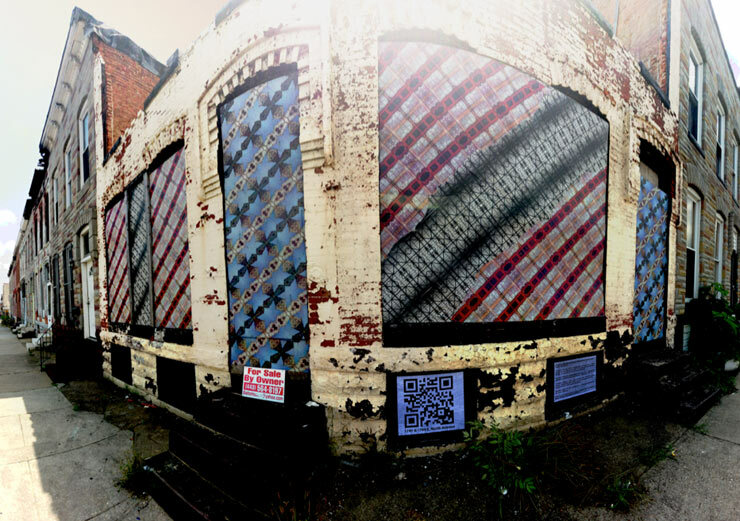 Next to the art are posted notices that incorporate QR codes that link to online data on the Slumlord Watch website so community members may learn about the housing and safety code violations on the property and about the owner responsible for the property's decline. When neighbors started accessing this information, phones began ringing. Already some of the properties have been razed because of their precarious condition and the danger they posed. Here are the stories of some of these installations as told by artists themselves and along with images of their work you can read some informational, insightful, even poetic, observations about their pieces for "The Slumlord Project". As you read, you realize that some undertook a fair amount of research to understand the relationship of their art with the vacant and abandoned property. Underlying some of these stories are also critiques of the developers who have more recently begun rehabilitating or renaming neighborhoods, social conditions, and the history of the properties. Below the images of the new pieces here some of the artists give background of their process and the conditions. While we would have liked to confirm the names of some of the landlords who have been referenced in their accounts, we could not in time for publication and felt it would not be responsible to print them. "I spent a month in Baltimore in 1982. Shortly after leaving I heard Nina Simone's version of Randy Newman's song 'Baltimore.' Though I've never heard Randy Newman's version, Nina sang is like she owned it and defined the persevering spirit of the city. 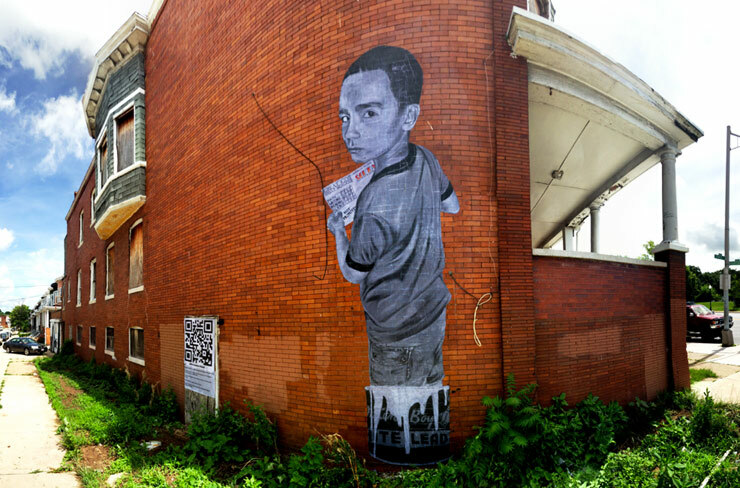 I shot this image in May of 2012 during Open Walls Baltimore. The girl in the photo, Johnnyasia, is an apprentice of Tony Divers, who is known at the Birdman of Greenmount West. The lyrics of the song appear around the periphery of the photo as a shout out to the city." "When conjuring up an idea I will be the first to admit I did play it a little "safe" going for a Raven -- Baltimore's football mascot -- but I feel the piece received a very positive response from the community. That was important to me since they are the ones who not only have to live with the eyesore of the building, but my semi-permanent installation as well. I created a mixed-media piece of a Raven building a nest. Wood slats from the building are held tightly in its grasp while "caution" tape blows in the wind from its calling beak. Nether popped up the QR code and we were out in a couple hours. 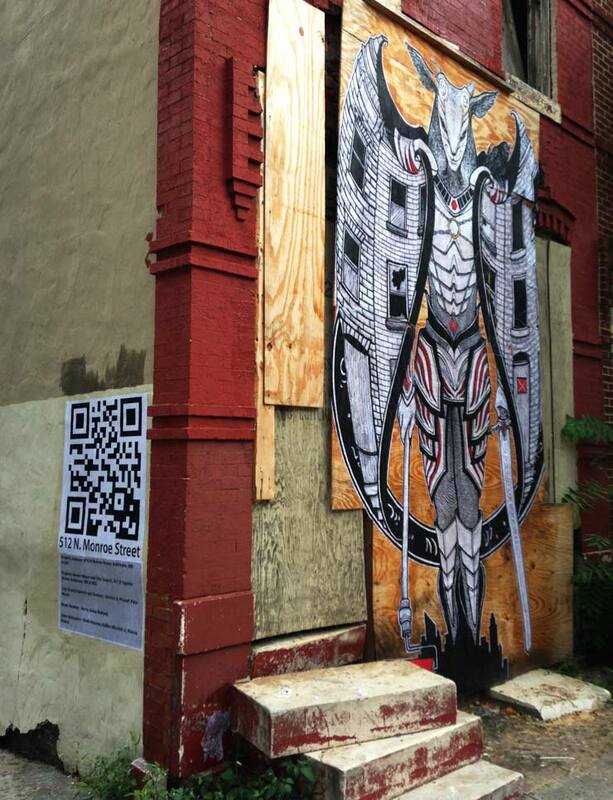 To our surprise, days later the QR code displaying the owners info had been torn down. Nether went and put it up again - it was later found torn down. About a week later Demolition signs were put all over the property - did our project come to fruition? Nobody is quite sure, but I want to say 'yes'. The property was eventually demolished about two weeks after its set date. All and all I am so glad for the neighborhood that those terrible buildings are gone. 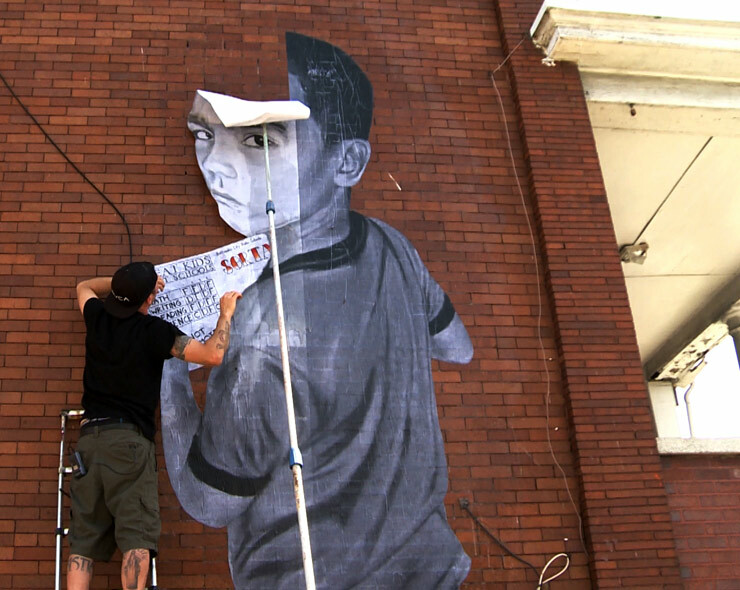 The project was amazing to be a part of and everyone's work was held in high regard by everyone - community members, the police, the drug boys, city officials, the general public, and fellow artists. 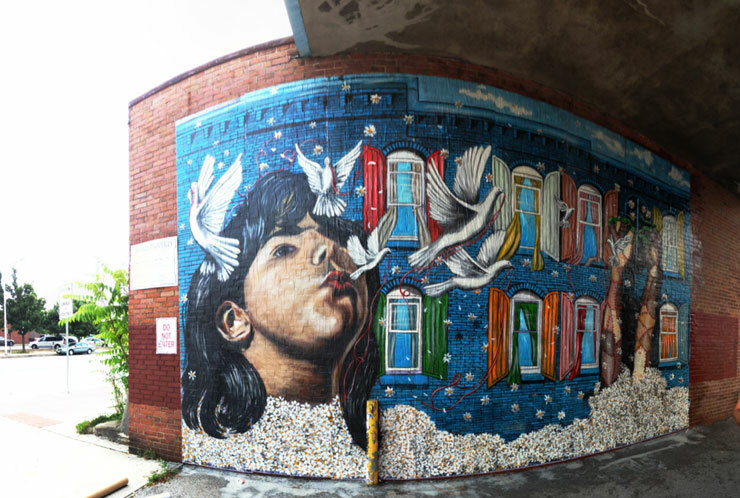 Wall Hunters has now made me look at my work, where I work, and my city in a much more specific way and I hope to do many more 'unsanctioned murals'." "The piece I made for my second install for the Wall Hunters 'Slumlord Project' was a piece that I designed for the Cherry Hill/ Westport/ Mt. Winan's area of southwest Baltimore. This is an area of town that is very off-the-map and many people don't even know it exists. It's an area with a lot of historic importance, has been crippled by drugs, vacancy, and poverty since the 90s, and soon will be developed into the new "Harbor West". It was created after FDR's "New Deal" and was built for black veterans returning from WW2. I find it most interesting and shameful when developers change the names of neighborhoods as they develop them. This area will become another example of that. 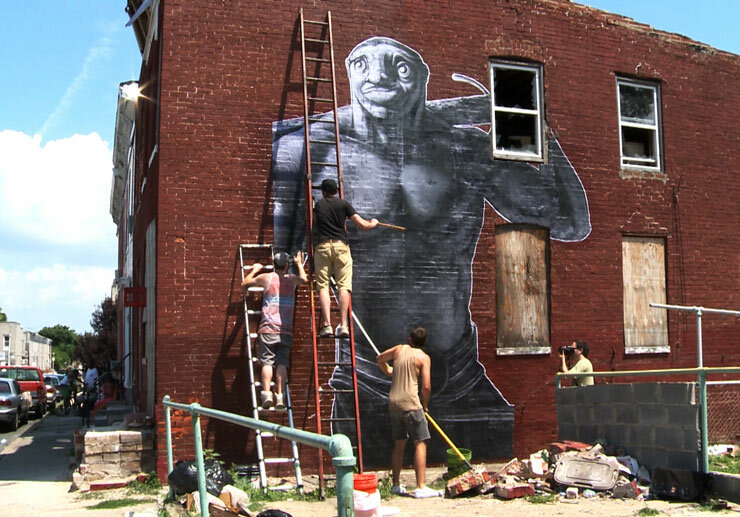 The character in the piece is my good friend Troy, who is from Cherry Hill. Troy has talked to me a lot about the area's history, and he encouraged me to do a Wall Hunters piece on the side of the abandoned Mt. Winan Projects. The Mt. Winans projects have some unsettling history in the dating from the 1990s. The police department twice, in 1995 and 1998, tried to put police substations into the projects and both times the substations were firebombed before opening. The drug operation running out of the Mt. Winans projects was estimated by some to gross $100,000 a month. It is my belief, and the belief of many people in the area, that the City and developer's plans are to destroy the collapsed identity of the area rather than help it once again thrive. 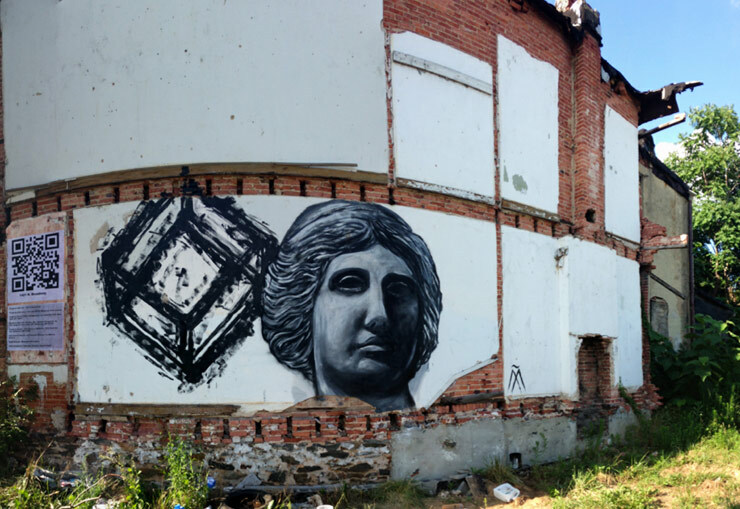 In the piece, Troy is holding together three structures which symbolize the fading history of the area, probably never to be revitalized. From left to right, a burned down abandoned multi-purpose center at the top of Cherry Hill which has been turned to a methadone clinic, some Westport-style row houses along Annapolis Boulevard, and the Section 8 building called The Cherry Hill Homes." 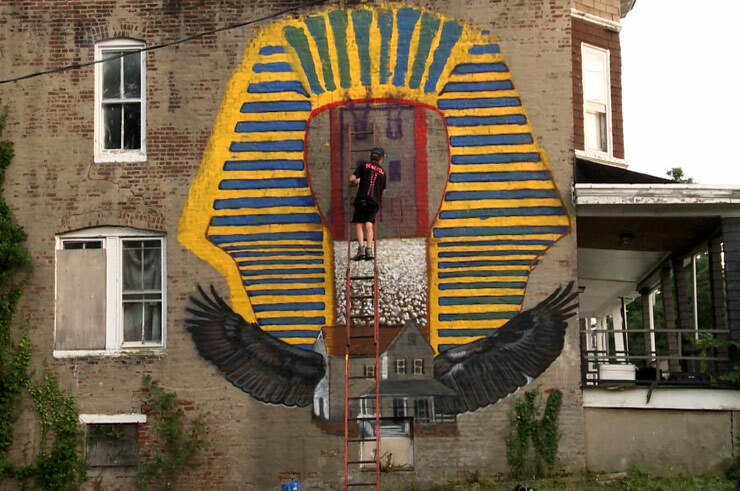 "This piece depicts the crown of King Tut with the visage replaced by a cotton field that fades into another row home owned by Rochkind. A normal suburban home from Pikesville with eagle wings floats above the words Exodus in Hebrew and English. Rather than vilify an individual who could fairly be labeled a slumlord, this piece visualizes the connection between the Jewish and African American experience with migration." " 'The Slumlord Project' is a direct overture to a much-needed, urgent dialogue layered with complexity. To put it simply, the project is a visual catalyst for reform. From its conception to the moment I approached the wall with paint, two terms, in particular, had resonated with me: narrative, as a lead-up and description to a conversation of the condition of a specific form. I painted a bust depicting a Greek Hellenistic muse next to a deteriorating cube. I chose the muse as a source of knowledge, relating a historical narrative of the neglected block. And for posterity, the bust of the muse personifies a face of prudence, relating the ability to govern and discipline oneself by the use of knowledge, reason, and truth." 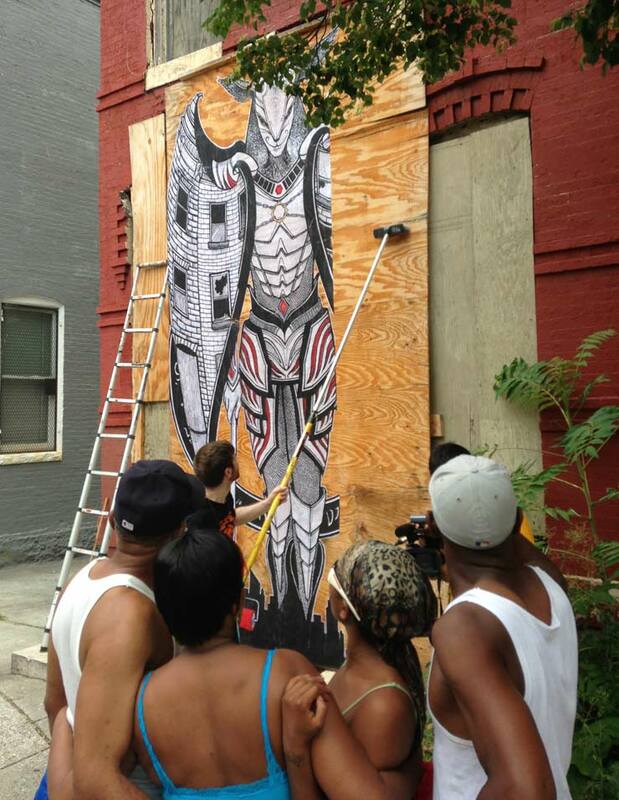 " 'Shawnee's Call' was totally colored by the public conversation Baltimore was having about the "Wall Hunters" project on paper and around town. I arrived a day before the Baltimore Sun published this article voicing businessman and real estate owner Stanley Rochkind's allegations of racism as a distraction to the real issue and I was painting on yet another one of his neglected properties. Needless to say the whole experience was very political but that is the point: anything that happens in the public realm is inherently political. 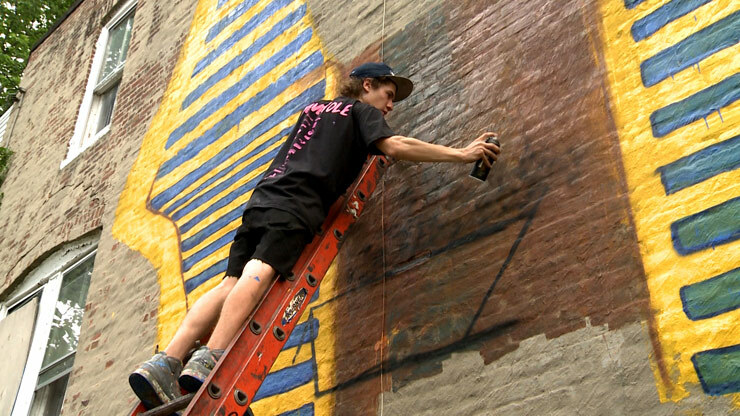 Loitering, picking up trash, smoking, putting up illegal murals, commenting on newspaper articles - it all comes loaded with meaning so my attempt was to channel that focus and attention back to the core of this project, which the mural depicts." 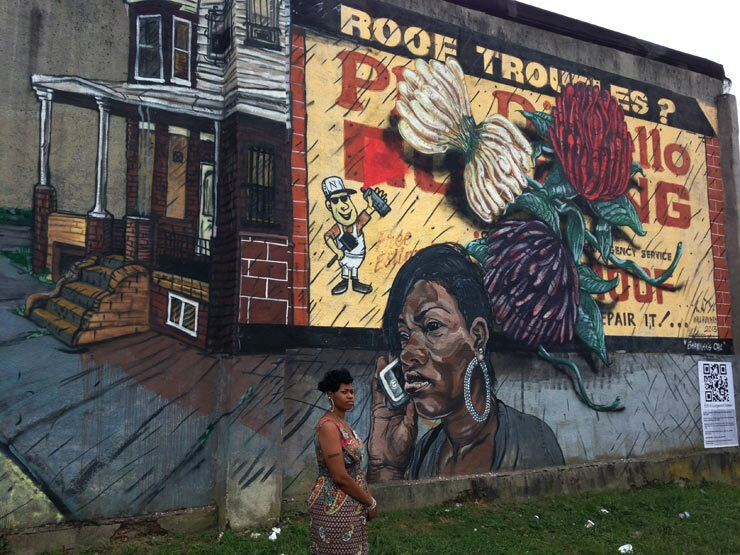 From what I understand, a neighbor of this property called and reported the property next to her house along with its violations, which, in turn, led me to that location to paint and it is this small act of concerned citizenship that the mural celebrates." To describe his project and his experience, artists Pablo Machioli wrote this poem. By colorful patches of human skin. They beg us to look inwards . Outside there's Milagro, but she is my sister. Each time exhales, a dove is born. And to let us and them breath peace. "Like many of the pieces in the project, mine was catered for the specific property. The "Vacant" that I pasted up on was noted as a lead paint infested dwelling. The house sits on the corner of a block with occupied houses all around it. Many of these houses have children living in them. Lead paint exposure has been proven to cause many problems for growing children, including learning disabilities. The subject of the piece is a real person, the son of a friend of mine. He's holding a Baltimore City Schools report card with failing grades and he's standing in an oversized bucket of Dutch Boy lead paint. I loved this project and the piece as the majority of my street works are portraits of people from the community. Additionally I often focus on children. But more often than not I try to capture real life topics, regardless of content and put it all together in a tasteful way. Sometimes I fail at this. However I know who is walking or driving down that street. As a parent I am cautious to not offend other parents who might be exposed to my work without compromising the point I'm trying to make. 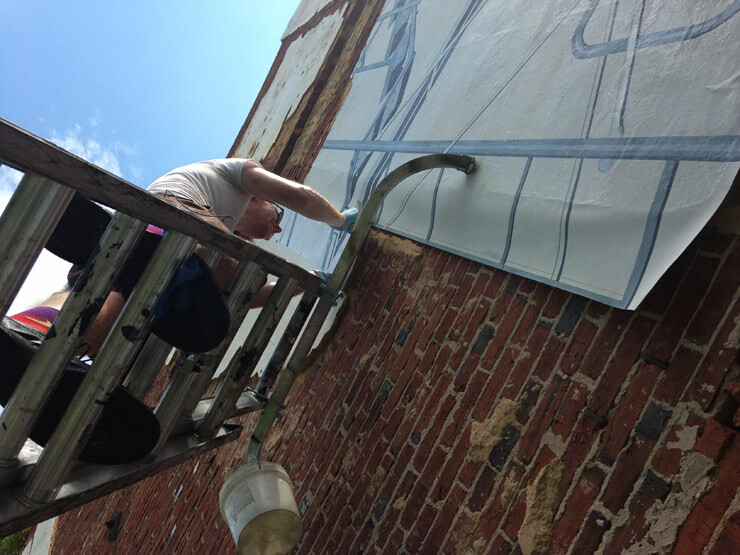 The best part about street art for me is the interactions I have with the people walking up and down the street when I'm installing something. 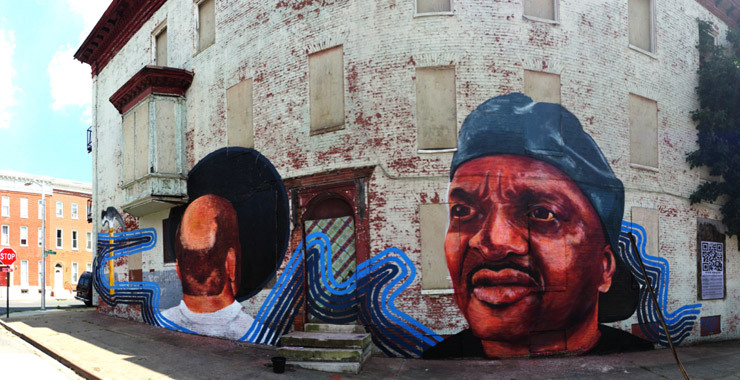 Baltimore offers a lot of love for street art and street artists; at least that's been my experience. They seem to appreciate it. I mean, what's easier to look at, a 14 foot tall portrait of a young man or the naked vacant building behind it that has been sitting there rotting for years?" to comment on the uncertainty of vacant properties in Baltimore. 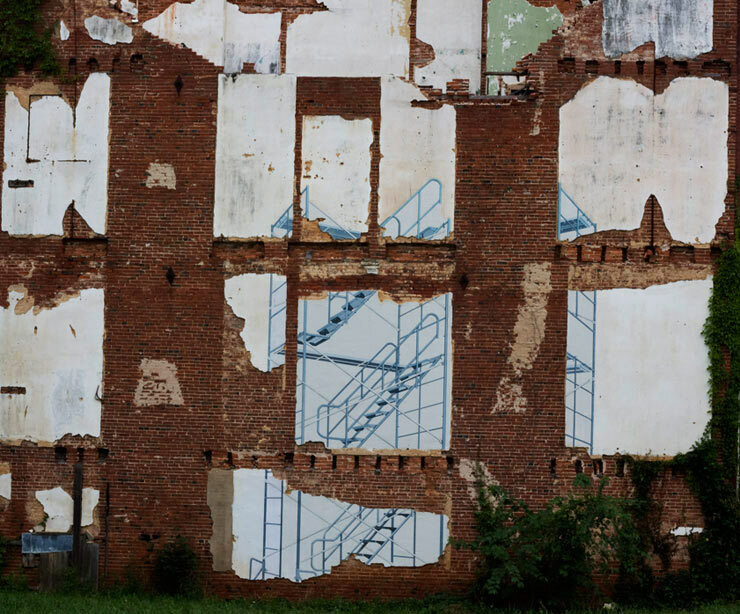 The stairs have an eerie emptiness to them that reflects on this uncertainty leaving the viewer in limbo and questioning the fate of these structures." "In addition to my installation, I was given the opportunity to design the 'Wall Hunters' logo. The project was rooted in some pretty complicated cultural issues. Attempting to broach such an involved ideology was causing me to churn out this... overly complex, incomprehensible logo art. So, I decided to approach both the logo and my piece from a more literal standpoint, using animal hunting imagery. I illustrated the lettering for the logo, adding a pair of horns as the 't' in 'Hunters.' I mimicked the knotty / gnarled horn texture throughout the lettering and added a cool light source to give it some dimension. My installation was a carryover from the logo. I chose to go with a hunter character in a 'hero' pose. I would never go as far as to say what we were doing was heroic as I have too much respect for the actual heroes out there. However, I did consider the participants and the overall project to be a force for good and I wanted to convey that feeling in my piece." 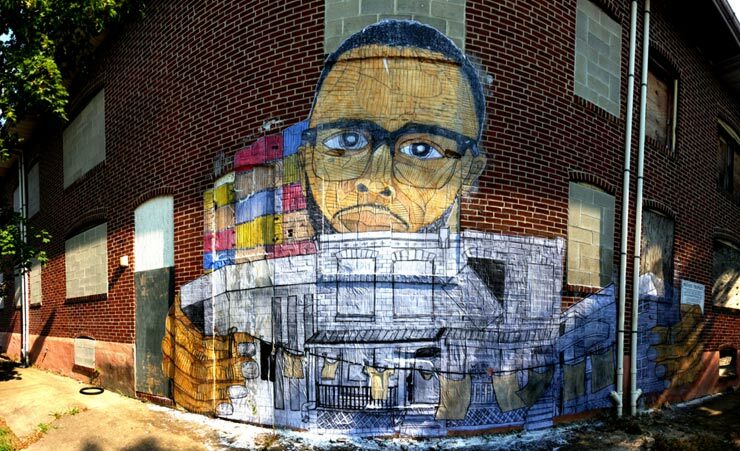 "This piece was pasted on what was reported to be the former base of operations for a self-proclaimed 'King of Baltimore', who was a convicted cocaine dealer and slumlord. These properties have been vacant for over 10 years." "In order for this piece to function, it simply needed to be activated. 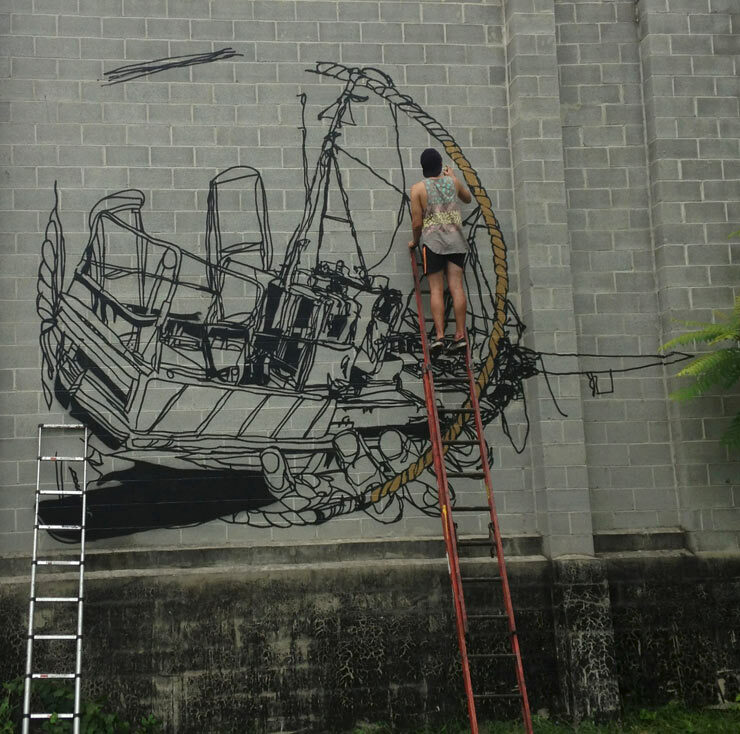 Creating 'A Ship Will Sink With A Neglectful Captain,' was such an exciting experience. One of the more crucial points I try my hardest to maintain in my practice is the attention given to the viewer. Working on this wall, with this community, gave me the opportunity to see the their reactions to my artwork as well as their interest and noninterest. Literally speaking with the community while working on this piece helped me understand what I do in my practice, and why I do it. I'm there for the process of assembling content, altering content, fragmenting it and spreading it out in layers. But I'm mostly driven by our people and our commonality."